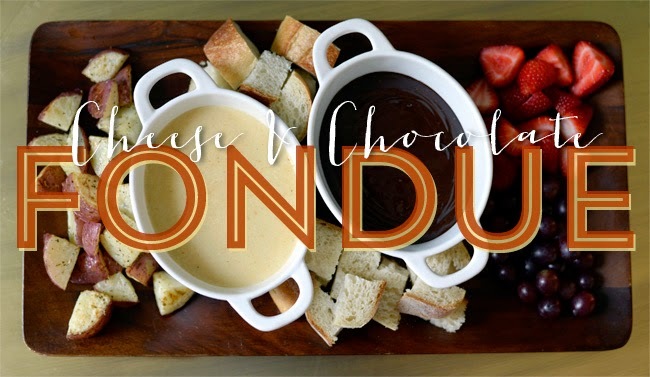 Pixel Whisk: I Fondue, Do You? 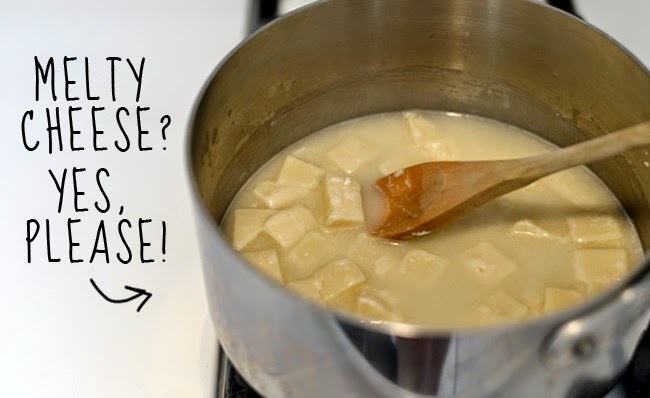 Ok, I understand there may be a few fondue haters out there. They're just jealous that fondue is no longer retro. In fact, it's coming back to mainstream entertaining in a big way. Also, fondue is really fun. (Well, I consider eating food smothered in cheese on a stick fun.) My decision to make fondue came the other night rather hastily. Basically, I wanted cheese for dinner. Not cheeseburgers or even a grilled cheese, just plain cheese. I knew there was a wedge of Gruyere in the fridge and I thought about plopping down on my couch with that whole hunk of cheese, calling it a meal and watching (yet another) episode of Discovery Channel's "Naked and Afraid". But then I realized I have a husband and a kid who wouldn't let that pass for dinner. Also, plopping down on the couch and relaxing at all is something dreams are made of these days. 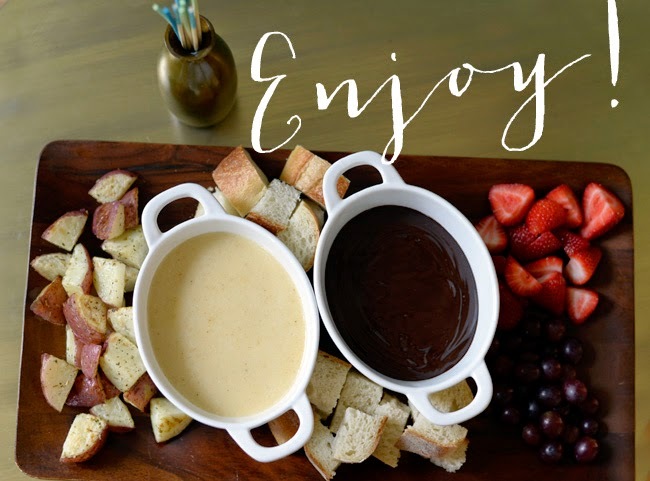 Instantly I thought of loophole where cheese could be the main event in our meal, FONDUE! It usually makes an appearance in the winter months, when its chilly out and you want to cozy up next to a pot of melty stuff. But when you have a craving who gives a crap what month it is. Also, I happened to have an abundance of delicious summer strawberries, so pairing them with chocolate fondue for dessert seemed perfect. 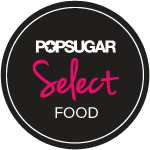 Next thing I knew, I was scouring my kitchen in search of any accoutrement for my cheese and chocolate fondue. I had a baguette, some grapes and red potatoes. I mean, you could pretty much dip anything in cheese and chocolate, they are just vessels anyway. With better planning, I would have stocked up on apples, cornichons and some pound cake (for the chocolate fondue), as well. I didn't have a traditional fondue pot, but it didn't matter–I ate all the stuff before it got cold, anyway. The skewers I used are the cheap wooden ones you can find at any supermarket. I gussied them up a bit by dipping the ends in some craft paint. It took about 5 minutes and makes them adorable and colorful. 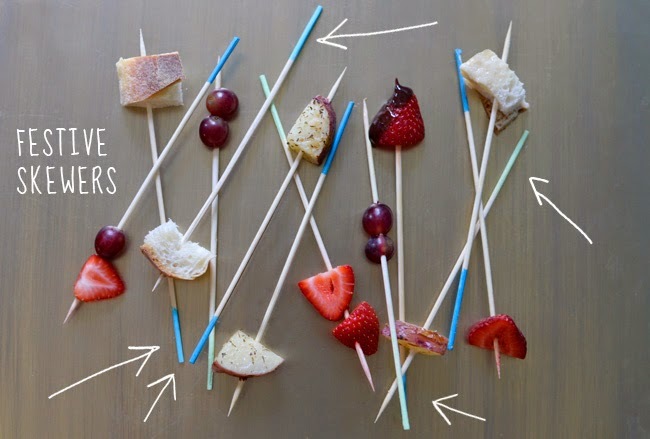 If you really get into it, you could color code the skewers for each dinner guest. Preheat the oven to 350 degrees and bring a pot filled with water to a boil. 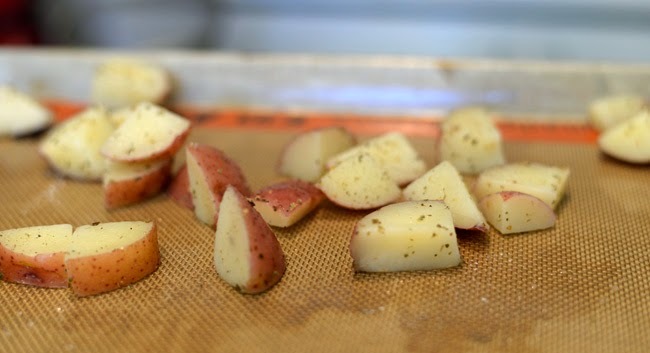 Wash and cut the potatoes into 1" cubes, then boil until tender and a fork can poke through them. Strain, then spread out on a baking sheet. Coat with olive oil, salt and pepper and the oregano or rosemary. Bake until edges are crispy, about 15 minutes. Set aside to cool. While the potatoes are in the oven, make the cheese fondue. Cook the wine over medium heat, bringing it to a low simmer. In a small bowl, mix the cheese with the flour, tossing it to coat. Gradually stir the cheese into the simmering wine. 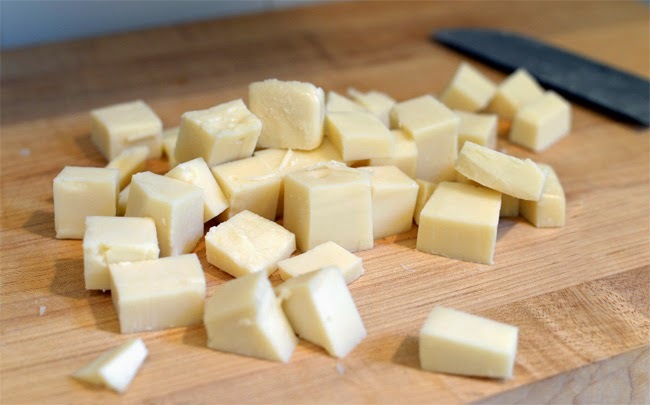 Melt the cheese slowly for a smooth fondue. Otherwise you'll have a stringy mess. Once all the cheese is melted, stir in pepper or a pinch of nutmeg. Transfer to a bowl and serve with dippers. Place the chocolate into a heat safe bowl and set aside. Heat the heavy cream in a microwave safe liquid measuring cup for 45 seconds, then pour over the chocolate. Let stand for a few minutes, then stir until all the chocolate is melted and smooth. Stir in the instant espresso power, then transfer to a bowl and serve with dippers.